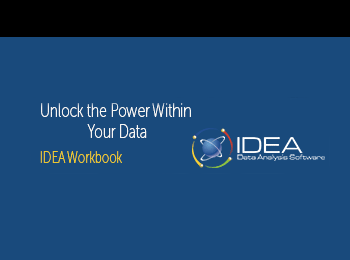 The IDEA Workbook is an in-depth tutorial applying IDEA tests and analyses to audits and investigations in accounts receivable, accounts payable/fraud investigation and inventory. Additional sections provide information on topics such as data requirements; designing and printing reports, re-running tasks, managing IDEA use; and provides potential tests for sales transactions, travel expenses, payroll and access controls that could be performed using IDEA. Data Files are available to be downloaded with the hard copy version. NOTE: Orders submitted after 1:00 PM Central will be processed next business day. Orders will not ship on Weekends or Holidays.